LG webOS Smart TV, webOS Phone, webOS Smartwatch, Fridge, Signage and Appliance user to user support forum. Ask questions and get help with your LG webOS products, discuss new products and older legacy webOS products by HP and Palm. 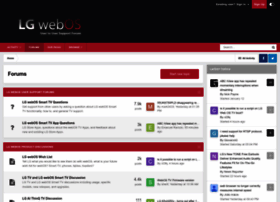 LG webOS user experience and help from existing webOS users.